My friend Kathleen and I are food geeks. There, I said it. (Yes, I know you knew I was a food geek, but she may be my twin in this case. Or close to it. I still think I’m geekier than she is.) 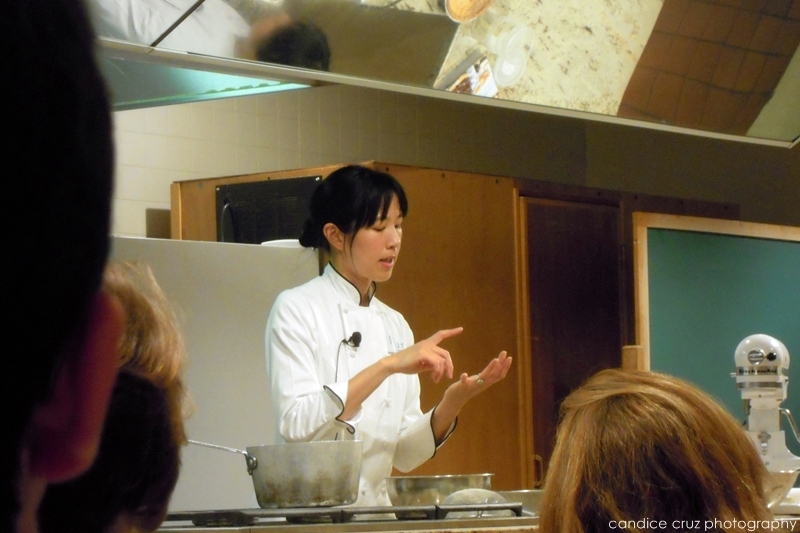 We both are huge fans of Joanne Chang of Flour Bakery and the restaurant, Myers + Chang, so when we found out about a food seminar at BU where she would be doing a pastry demonstration we didn’t hesitate to buy tickets. 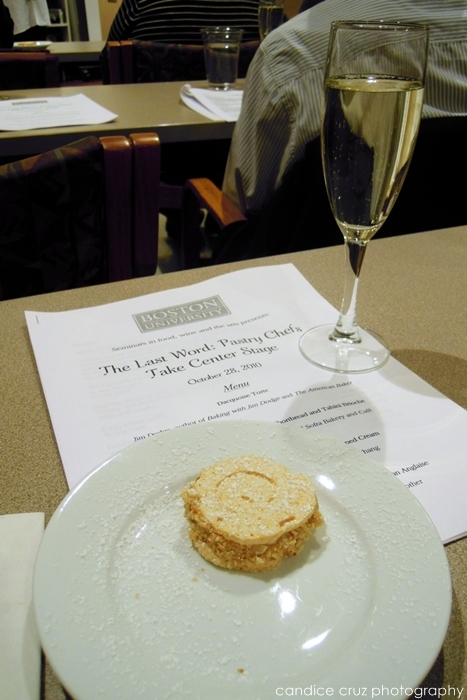 We got there a few minutes after the class began because of dinner (see previous blog post), and were pleasantly greeted with a glass of bubbly champagne at our seats. Jim Dodge (author of The American Baker) was at the demo table demonstrating how to make a Dacquoise Torte, and there was a smaller version on a plate for us to try. Even though it has hazelnuts in it, I tried a little bite and it was so delicious. I ended up wrapping it up in my napkin and bringing it home for Tony to try. 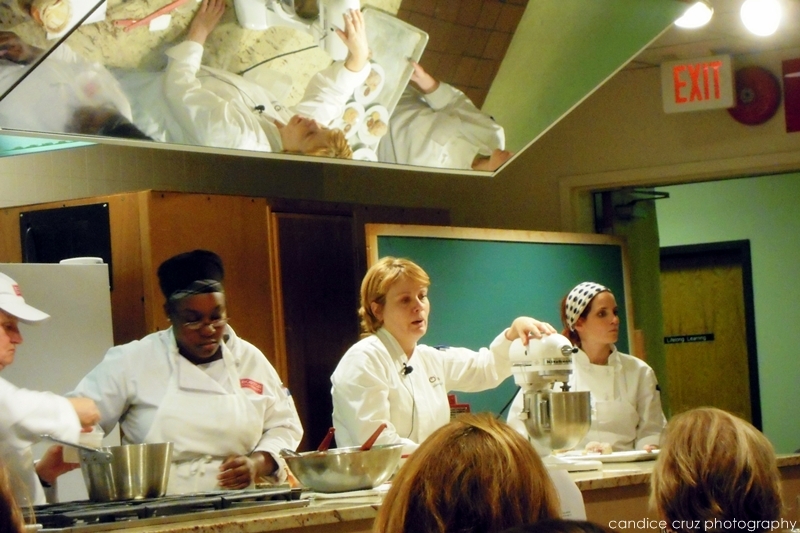 The second demonstration was by Heather Tirrell who was formerly a pastry chef at Hungry Mother. 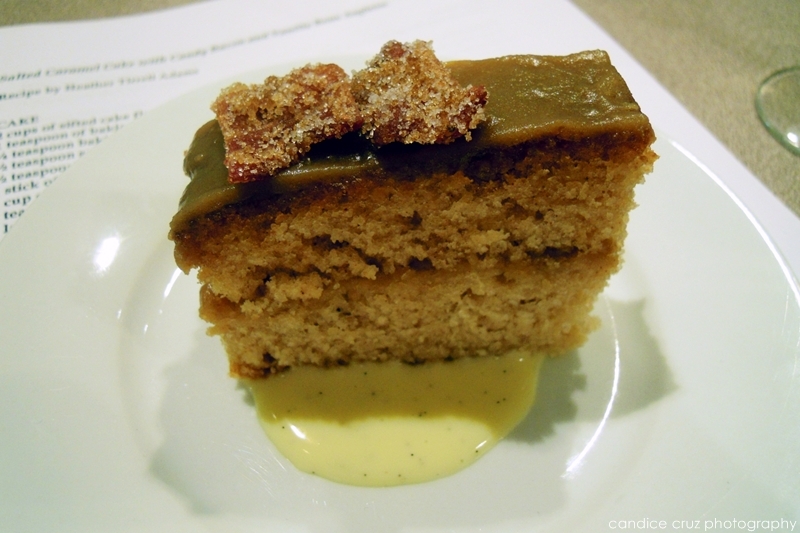 She made this incredibly awesome salted caramel cake with candy bacon and vanilla bean anglaise. Oh. My. God. Kathleen and I both ate every morsel of it, it was so fricken good. 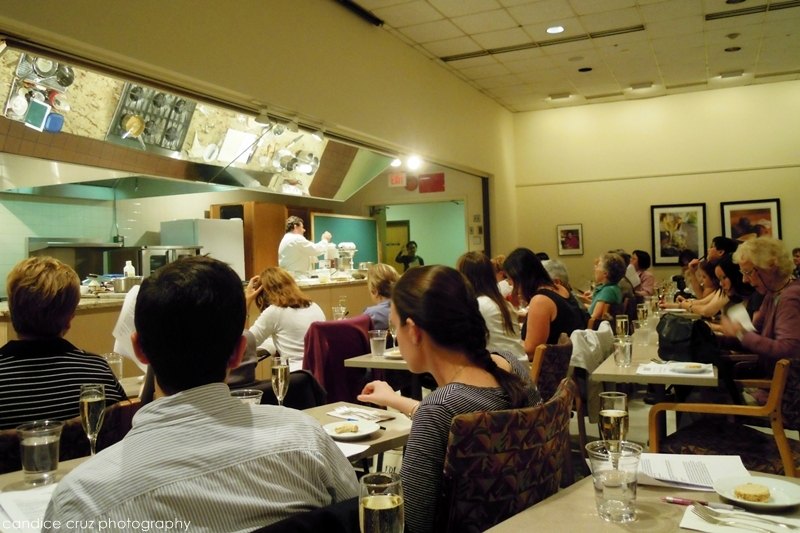 The next pastry chef was Maura Kilpatrick of Sofra Bakery and Oleana Restaurant. 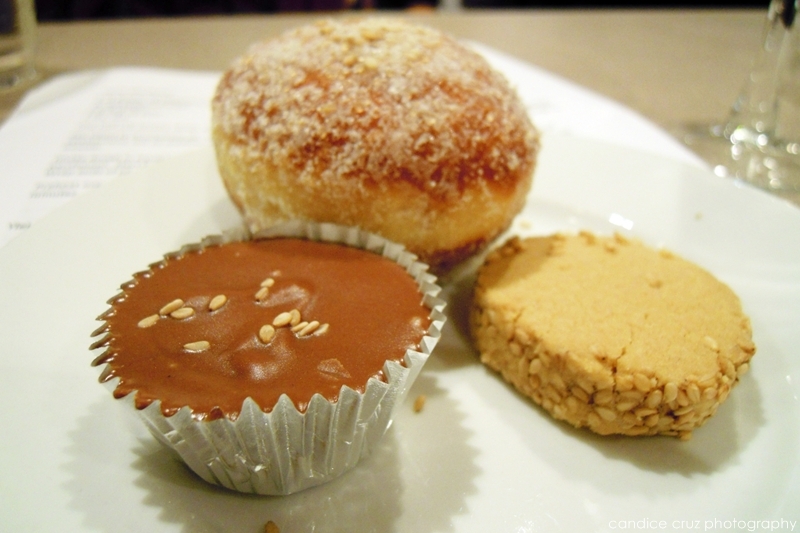 She created three desserts for us to try based on tahini as a main ingredient: milk chocolate tahini bites, tahini shortbread, and tahini brioche. What was super super cool (yes, double super!) was her comment about a chef that she works with who is allergic to peanuts (like me!) and how he loves these tahini desserts because they taste like peanuts. I seriously had a revelation: if a sesame seed is not a nut like I thought it was, then I can eat them. Whoa! Last but not least was Joanne Chang’s demo of how to make the toasted coconut cream pie with lime whipped cream from her new cookbook. One thing I like about Joanne is how down to earth and funny she is. She makes baking seem so easy (of course, it’s always nice to have things pre-measured for you) and she has a no-fuss attitude which is great. 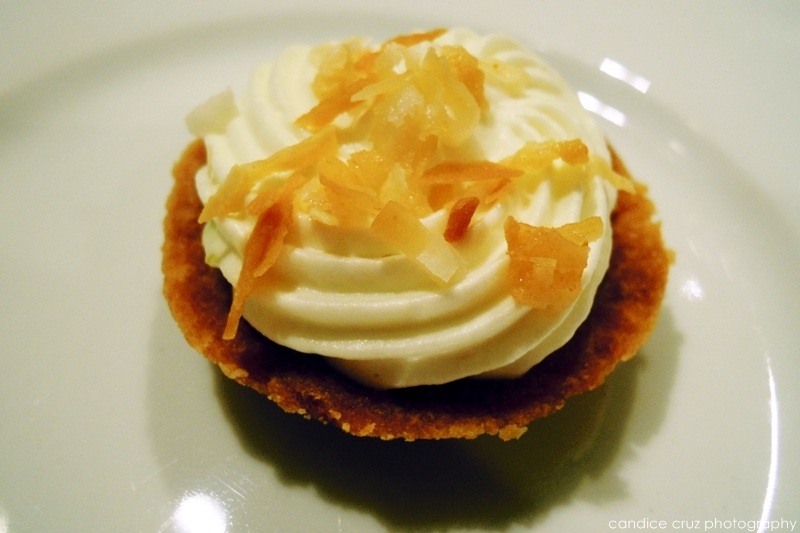 ﻿﻿﻿﻿We got to try a small little tartlet version of the pie which was simply delicious – we seriously did not eat anything bad that night, that’s for sure! And speaking of geekiness, Kathleen and I are going to see Joanne on Saturday at a book signing event. Cross your fingers that she doesn’t think we’re the stalker-ish kind of fans! The pastry chefs did a little Q & A session at the very end and it was nice to hear them talk about techniques and products that they liked to use. The seminar was overall quite a fun and exciting event. Not only was it a neat way to see local chefs in action, but it was a great learning experience and we were able to take home all of the recipes too. I would definitely go back to another one of these events, especially the dinner type of events that another attendee (a sweet husband who was there because his wife really wanted to go) told us about. It was nice because they also stayed after the seminar was over for autographs (Joanne’s books were available) and answer questions. This entry was posted in baking, brioche, cake, caramel, coconut, cookbook, cookies, flour, Hungry Mother, Joanne Chang by shortcakescraps. Bookmark the permalink. Oh my gosh! I was at this and searching for the recipe for the espresso buttercream that Jim Dodge made. I recently lost my packet from the class (UGH it was full of my favorite recipes!) Any chance you’d be willing to share?? ?